Vitamin A has an important role to play in vision, bone growth, reproduction, cell division, and cell differentiation. 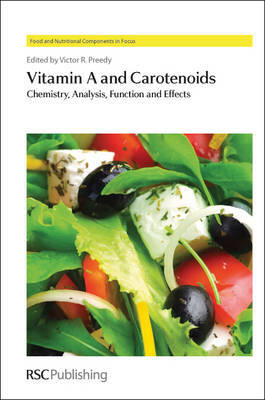 With the focus on Vitamin A and Carotenoids, this book includes the latest research in these areas and starts with an overview putting the compounds in context with other vitamins, supplementation and discussing the importance of beta-carotene. Details of the chemistry, structure and biochemistry of the compounds begins with nomenclature followed by information on encapsulation, thermal degradation and occurrence. Developments in analytical and bioanalytical techniques concerning these compounds in plant, milk and human tissue systems are covered in detail. Finally, the book covers the extensive functions and effects of Vitamin A on eg developmental growth, immune function, cancer risk, the brain and lungs as well as vision. Delivering high quality information, this book will be of benefit to anyone researching this area of health and nutritional science. It will bridge scientific disciplines so that the information is more meaningful and applicable to health in general. Part of a series of books, it is specifically designed for chemists, analytical scientists, forensic scientists, food scientists, dieticians and health care workers, nutritionists, toxicologists and research academics. Due to its interdisciplinary nature it could also be suitable for lecturers and teachers in food and nutritional sciences and as a college or university library reference guide.